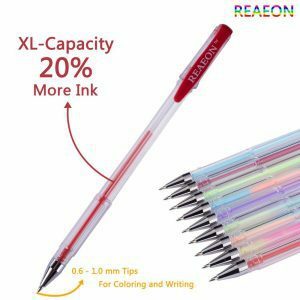 Customers will find that the REAEON 160 XL Gel Pen Set will last longer which takes away the worry of running out of ink in the middle of your projects. Which means no more gel pens drying out than putting a stop to your creativity or even ruining hours of work. The medium tips will allow the gel ink to flow smoothly from the pen and across any paper type. With aid of the REAEON colored gel pens your projects will be turned into works of art. 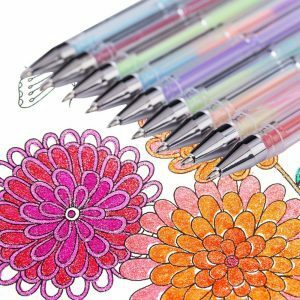 Because of these gel pens you can take a drawing, scrapbook, school or craft project over the top. As a result you can make your own greeting cards or invitations showing your artistic flare. You can eve send a letter filled with color. What a great gift for the budding artist in your life or even for yourself. Most of all coloring can help reduce stress and to help you relax after a long hard day. The colors will brighten you mood while letting you express your creative side. 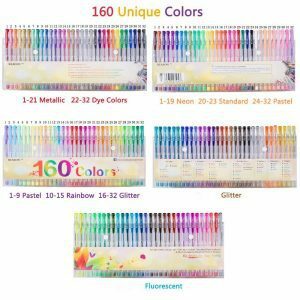 The REAEON 160 XL Gel Pen Set offers every color you will need or ever want. After testing the REAEON 160 XL Gel Pen Set we can both say they live up to their claim. Each of the gel pens glided across the paper leaving a colorful design behind. The self storing caps keep the gel ink from drying out. Also, the pen caps match the color of the ink. As a result of our love of these markers we have teamed up with the REAEON brand to giveaway a 160 XL Gel Pen Set. Enter below. Previous: Previous post: Summer Cool Down Giveaway! No I have never golfed. Being left handed, I am just not coordinated! What an awesome set of pens! I am excited that they write smoothly without skipping! Never actually golfed. I used to go miniature golfing and to a driving range but I sucked so I never went out on a course, lol.